Rivers tell our story, from the earth’s early rotations when rains started wearing down our mountains and carving paths to the oceans, to contemporary North Carolina, where rivers nutured native settlements and sprouted towns. And they still beckon us, sending us downstream in a rush or ushering us along tranquil passages. In the wake of my paddle, the water swirls in micro-currents and miniature eddies, each trailing away to tiny paisleys of foam and then to nearly nothing, a few distant surface bubbles the only sign of my passing. I love that sense of surreptitious passage, the way a river seems to part for a quietly paddled boat, closing like a curtain in the wake of the paddle, just beyond the place where the bubbles disappear. With each stroke, the river presents itself anew — another few feet of sandbar exposed, an altogether different view between the trunks of the riverbank sycamores. It’s like thumbing through a photo album one page at a time, stopping to linger over whatever image catches your eye. You have to paddle a river to know this. My paddle is light as meringue, a bent-shaft model of red cedar, basswood, and ash. It was made by the long-defunct Dan River Paddle company, which once turned out 1,000 handmade paddles a year in a tiny shop near Madison. I love that old paddle, how it enters the water in utter silence, how it moves a canoe with the authority of an elder, how it bears the name of a treasured North Carolina river. I love it enough to have shipped it across North America — to rivers in Alaska and Arkansas, to Ontario, Quebec, and Labrador. It is a well-traveled paddle, but I like to think that, like its owner, it’s never happier than when dipped into the rivers of home. For 30 years, I have poked the nose of a canoe, a kayak, a johnboat, and a powerboat into the nooks and crannies of North Carolina rivers from the Eastern Continental Divide to tidewater. I have paddled the Nantahala and the Neuse, the Cashie and Catawba. When I graduated from high school, many of my pals hit the road to the beach. I struck out on a five-day float along the New River. During my college years, when the movie Deliverance sparked a whitewater rush, we paddled the Nantahala and the Nolichucky on long river-running road trips, and took quick adrenalin hits on Piedmont whitewater streams such as the Haw and Mayo and Dan and Rocky. I’ve boated the Cape Fear and the Yadkin, Pee Dee and Uwharrie and Eno. Little. Flat. Tar. Bay. Black. Pungo. Pamlico. White Oak and North Landing, Scuppernong and South. Lumber and Little Tennessee, one as unlike the other as black coffee is to clear corn liquor. There are more than 40,000 miles of rivers and streams in North Carolina. You could float a mile of stream a day for 100 years and not see them all. But that is not my intention. I’m not on some quest to tic off North Carolina rivers like a birder’s life list. In fact, over the past couple of years, I haven’t plumbed a single inch of new river, contenting myself, instead, with the same few stretches of a few familiar streams. These days I putter along, paddle in hand, fly rod nearby, noodling for memories. To be sure, North Carolina rivers shaped and molded the North Carolina we know, what she is, her shortcomings as much as her achievements. You can’t get through the doors of a North Carolina middle school without understanding that the state’s relative lack of navigable rivers and natural harbors prevented her from ascending to the lofty heights — real or imagined — of our mercantile-minded neighbors to the north and south. The Old North State’s stony rivers stymied steamboats and kept her thinly settled and humbly situated. Backward, some would, and did, say. But those same conditions kept our rivers relatively intact. The waterways were used for navigation and transportation, sure. But until recent years, North Carolina’s rivers were relatively free of large urban centers, and relatively clean, at least as compared to the polluted and fouled rivers of many regions. I can’t recall of a North Carolina river combusting into flame, like Ohio’s Cuyahoga did 40 years ago. And while most of the ills affronting Tar Heel rivers are unseen — pollution that washes off agricultural fields or gets pumped into the river’s flow from wastewater treatment plants — we’re blessed that there are few parts of North Carolina untrellised by a river that seems to wash away the years. This sense of moving backward in time, of drifting toward the past, isn’t limited to the Roanoke. Nor is it a figment of imagination. The New River of North Carolina’s mountains isn’t new at all; practically every Tar Heel fifth-grader knows that it’s the oldest river in North America. But most rivers seem to naturally embody a sense of age, and I don’t mean a haggard antiquity or a worn-out decrepitude. I’m thinking more of a grand sense of age, a venerable bearing carried even by the meagerest stream. Paddle the Black or the Lumber, and you can glide under cypress trees so old that Carolina parakeets might have roosted in their trunks. Float the Uwharrie, and you careen through the bottom of some of the oldest mountains on the planet. Even the Cape Fear River, unfurling through the flat Coastal Plain, is an amusement park ride through the Pleistocene. Just upstream of Wilmington, the river cuts through several massive sand-and-coquina ridges — the ancient, stranded shorelines of prehistoric seas. Surely even the most smartphone-addicted and Xbox-addled among us can imagine the North Carolina of yore while drifting through an eastern North Carolina hardwood bottomland swamp-forest, or even a wooded stretch of an urban stream. Sometimes, the flights of historical fancy aren’t imaginary. For all of their wild environs, most North Carolina rivers hold the touchstones of human cultures long past. I’ve come across rusted moonshine stills along the bluffs of the Uwharrie, the remains of old haul-seine wharves on the edges of the Roanoke, ricefield dike gates along the Cape Fear. Ring bolts sunk deep into the flesh of cypress trees along the Black River might once have held steamboats in place. Paddle the Yadkin just upstream of High Rock Lake, when the water is low, and you pass deep clefts running downhill from ridgetops. There, the old Trading Path is a deep depression in the woods, lined with mayapple now, but it was once filled with muck and mud as traders crossed the stream with horses laden with deerskins and wolf hides, ginseng and trading beads. Once, on the Cape Fear River, during a johnboat trip from Lock No. 1 at Elizabethtown downstream to the Wilmington waterfront, I happened along a four-foot chunk of a dugout canoe. High water had scoured out a mudbank where the ancient boat had been discarded or forgotten who knows how many centuries ago. I dug the fragment out with bleeding hands, dumbstruck at finding such an artifact due to little more than heavy rains and good timing. But what is most beautiful about rivers has little to do with the past, but the present. It’s the way they foster new discovery. We were on the Neuse River one day, my daughter, Markie, and I, when she was 6, maybe 7, years old. It was a sunny March day, bright but cold, and the river was running a bit high, so the current made paddling an option most of the time. Just keep the boat out of the trees and pointed downstream. That particular stretch of the Neuse, between Raleigh’s Buffalo Road and New Bern Avenue, meanders past housing developments and scattered woodlots, and is as unremarkable a piece of river as you will find in North Carolina. Still, Markie was completely absorbed in every detail of our surroundings. She commented on a rush of details — a river birch beavers had nearly felled, kingfishers darting along the water in their telltale flight, as if they were launched from a slingshot to dip toward the water surface, then suddenly rising again in a flurry of wing beats. The way a brown oak leaf floated in the water, leaf tips curled toward the sky as if connected to some unseen puppeteer. Granted, hers was an age when every sensory input must seem like the smell of your first Thanksgiving dinner, something altogether new and wonderful, to be savored because, to a child, when will we ever ever have cranberries again? But I like to think that the river had something to do with it, too. Something about a river sends me back to a similar mindset. Soaking in every sight, every turn in the river. I catch myself transfixed by the most common sights. “Look at that sprig of holly,” I will say to myself, in complete wonder, as if I’ve never seen the red berries of American holly before, reflected in the water along the river’s edge. Then I paddle another stroke, and another, and, when I look back for another glimpse, the holly is gone. The curtain has closed. Perhaps the saddest thing I have ever heard, I heard on the banks of a river. It wasn’t sad in a tragic accident sort of way, or a sudden and unexpected terminal diagnosis sort of way, but sad in the way that something altogether unfortunate and very nearly irrevocable has come to pass, and that very little can be done to recapture what’s been lost. I’d spent a day snorkeling the low, summer-tepid waters of the Little River with John Alderman, a fisheries biologist. We were searching for rare Atlantic pigtoe mussels. But it wasn’t the lack of endangered mollusks that I recall so much as a comment Alderman made as we sprawled on a muddy sandbar to sort our collected shells. I’d been reminiscing about my misspent youthful days wading the creek beside the house where I grew up, in High Point, chasing green snakes and bullfrogs hour upon untold hour. I remember a shared silence at that very moment. There was nothing else to say, nothing that we could think of to soothe the loss we felt for children we didn’t even know. I have hauled my kids to the water ever since. We don’t go as much as I’d like, but we go as much as we can. 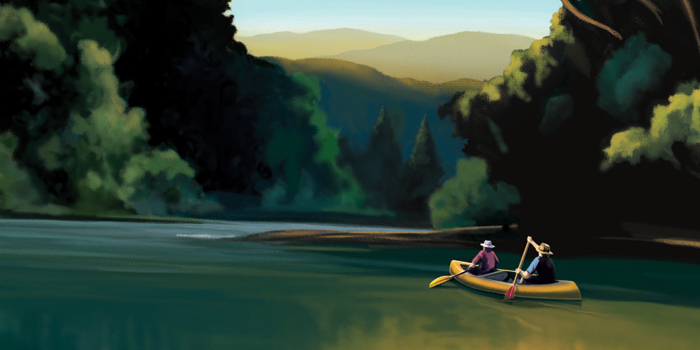 Down to the river, and I don’t care in what — a canoe, a kayak, an inner tube, a kneeboard, a rocket ship. Every drop of water that has ever bathed our blessed green orb is still out there, still flowing, still murmuring and gurgling and roaring, still slipping by and why-don’t-you-take-a-ride? We dress in bathing suits, old T-shirts, and river sandals, and the only rule is, you have to stay in the creek. No shortcuts around fallen logs (climb over ’em), deep holes (swim through ’em), or sandal-sucking mud pits (cross your fingers and lift your feet toes first). We chase crawdads, poke at dead fish, throw rocks, climb trees, and wade to our shoulders. I can hear it now: What about snakes? What about tetanus? Those kids — they could fall in, you know, pick up some kind of infection! But none of the remote possibilities for bad stuff — cuts from busted beer bottles, spider bites, encounters with serpents, poison ivy from head to toe, even soaking in a few molecules of PCBs from a pollution site upstream — can compare to the almost-guaranteed run-ins with the good stuff afforded by a flowing body of water. We’re gone a couple hours, tops. Then we burst through the basement door filthy, plucking ticks from our legs, reeking of mud and carrion, and tromping straight for the bathroom and a shower. But we’re renewed, fresh from our baptism in the cleansing flow of a creek on its way to a river. T. Edward Nickens is an editor-at-large for Field & Stream. His articles also appear in Smithsonian and Audubon magazines. He lives in Raleigh.